When people have to be divided into groups with limited seating, depending on their preferences (or not), an intractable puzzle arises. How to distribute them? First come, first registered? Distribute in an "authoritarian" way? Attri-group is the solution! This program allows you to assign a random order to each person. Then, in this order, it distributes the people in their choice N°1, as long as there is room. It lists all the unregistered people, then tries to place them in their choice 2, then 3,... until they choose 6. The program creates 1 list for each group and a list of non-registered people,... if there are any left! 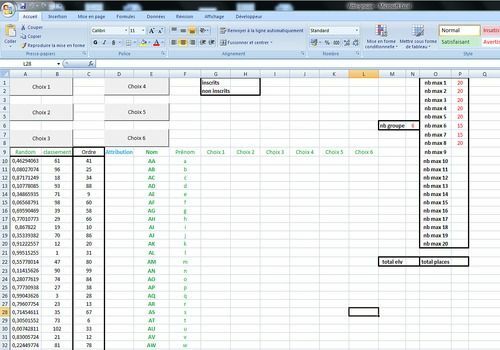 The program uses an excel file, in which you must write the first and last names of all people, as well as their 6 choices in order. Intuitive program, easy to access, well presented. Up to 6 choices per person to be distributed. Up to 20 distribution groups. Possibility to make a random distribution to quickly form groups (without taking into account the choices). Contact: on the operating instructions page. An online application allows teachers to create an online project, students define their choices and the site distributes them. Contact me by email to know the address of this site.